All the Hyatt properties in Asia-Pacific are welcoming 7 new hotels in the region and offering up to 30% off rates for stays between December 20, 2013, and February 28, 2014, that are booked by February 23. You need to make the reservation using offer code APHOL and you can access Hyatt’s web page for this promotion here. Make sure that you have the APHOL on the special offer code box. If you use this link, it will be there automatically. 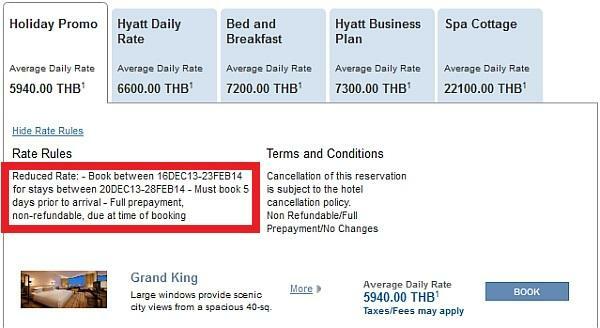 The Hyatt Daily Rate was discounted by 10% at the Grand Hyatt Bangkok by using this offer. Many hotels are offering extra discounts for stays around the new year, when the business travel nose dives especially in Asia due to Chinese holidays. You should check the rates using this offer, if you have planned stays around the region to see if there are any savings to be had. Offer valid for bookings from Sunday, December 16th, 2013 and Sunday, February 23rd, 2014, for travel between Friday, December 20th, 2013 and Friday, February 28th, 2014. at participating Hyatt Hotels & Resorts, Park Hyatt and Andaz properties in Asia Pacific. Reservations are subject to availability and must be made at least 5 days in advance. Full non-refundable prepayment required at time of booking. Offer is for a limited time only. Simply request offer code APHOL when you book your reservation and pay the Holiday Promotion rate. Discount is off the Hyatt Daily Rate for standard room accommodations. Rate is per room, per night, excluding service charges, taxes and other incidental expenses. Rate is based on single occupancy. Additional guest may be subject to additional hotel charges. Additional charges apply to room-type upgrades. A limited number of rooms are allocated to this promotion. Full, non-refundable, prepayment due at time of reservation. No changes, amendments or cancellations allowed. Changing to a different property is considered a cancel and re-book, and is non-refundable. Canceled reservations and no shows will forfeit the full prepayment. F&B discount only applies to bookings made under this promotion for stays in the seven hotels listed above. Promotional blackout periods may apply due to seasonal periods or special events, and normal arrival/departure restrictions apply. Hyatt reserves the right to alter or withdraw this program at any time without notice. Previous articleIHG Rewards Club Promotions Update: All Gone For Now?